I flew with Cathay Pacific. The plane from Manchester to Hong Kong was huge, and quite comfortable, even in Economy (standard) class. There was some great in-flight entertainment and the food was miles better than it was back when I was like 13 and going to Florida – or maybe I’m less fussy now. Unfortunately, I had a kid in front and behind so I was subject to 11 hours of kicking from both sides. The couple next to me were nice and while I didn’t sleep, I kept my cool with it all. I landed at just after 7am local time the following day. I couldn’t check into the hotel until 1 or 2pm but they did hold my rucksack. I went to explore Kowloon for the day and had to decide whether to sleep in the afternoon or power through. Day one was spent in Kowloon, the more, how can I put this, local side of Hong Kong (and all around it except the south). Now, the language barrier was going to be an issue. I had learnt a few basic words to get me going; hello, thank you etc but even then, a lot of the signs weren’t in English. Official signs were, but restaurants and shops, no chance. Thankfully, I never encountered any problems. There was almost always someone who spoke at least some English and we muddled through. Google and smartphones were my friend in the times I was held behind a language barrier. I didn’t want to buy much, because the whole point is me travelling light but I explored the Temple Street night Market and the Ladies Market and a lot of parks. 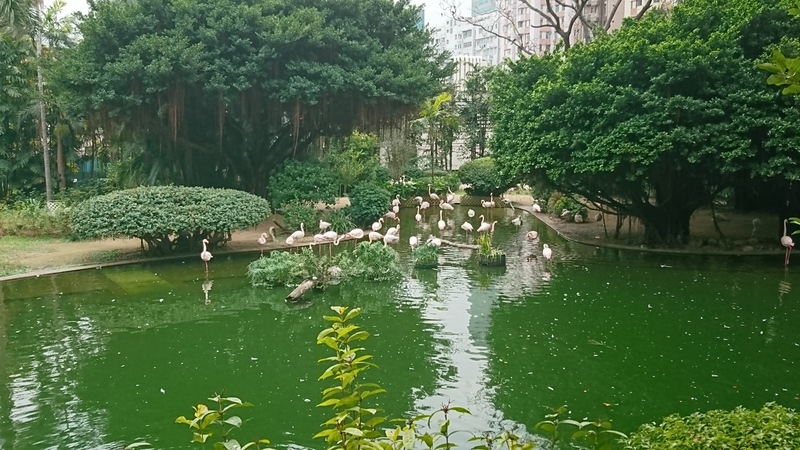 Kowloon Park was fantastic and had fountains and an aviary. The difference between night and day is stunning. There was also the Star Garden, with statues, sculptures and information on local and national stars. The waterfront is also nice, and at Kowloon side of Victoria Harbour there’s a cultural centre. At night, the city comes alive. The lights transform everything and there’s a brilliant light show at 8pm you can watch involving the buildings on Hong Kong Island. You need to get there a good hour or so early though to get a good spot to watch it from! There’s street food everywhere, meaning you won’t go hungry. It took some pointing to rather than talking with some of them but I had some great snacks throughout the day. It’s worth noting that shops and restaurants don’t always open early. Some will open from 9am-ish but more from midday and even more from mid-afternoon to 5pm. A lot of places are open till about 2am, though. Adjust sleeping patterns appropriately. Day two took me to Hong Kong Island, across the Victoria Harbour. There is a ferry but I took the local metro system, the MTR. Quick and easy. While all of Hong Kong features sky scrapers, it hit me a lot more here. I arrived in the business district, with a lot more high-end shops on the go. You’ll find a lot more expats on this island and the signs, both official and window based, included more English. My first stop was the Peak Tram to take me up a bloody big hill. Took an hour to queue but it wasn’t a walk-able one – not for me. At the top is a viewing platform. Now, we all know I HATE heights. Nevertheless, I went and did it. I took the obligatory selfie and absorbed the views. It was a bit murky (unfortunately it was all three days I was there) but that doesn’t take anything away. I then went on a walk around Mt Austin and climbed up an old stone path (why do I do this to myself?) to a spot higher than the observation platform. Got some even better pictures but not of the same view as there was a lot of foliage in the way. 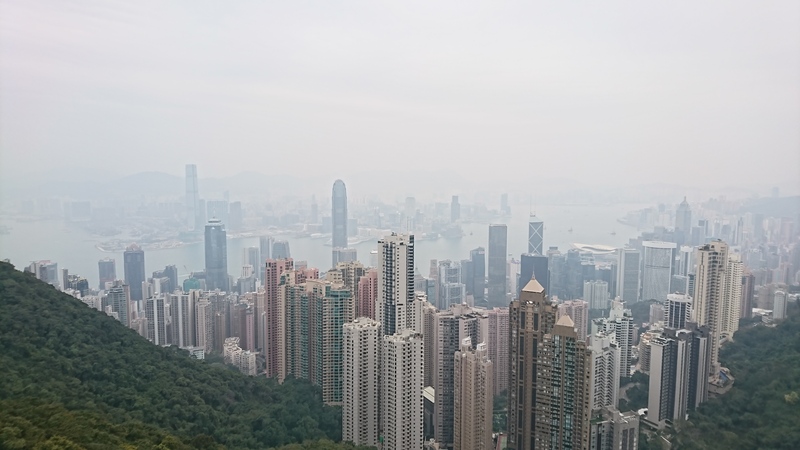 It was then back on the Peak Tram and up the road to Hong Kong Zoological and Botanical Gardens. More great views and a lot of animals to see. This was a free area too, with refreshments in the area. From there it was a short jaunt back to Hong Kong Park (which had another vantage point but I avoided the stairs on this one). 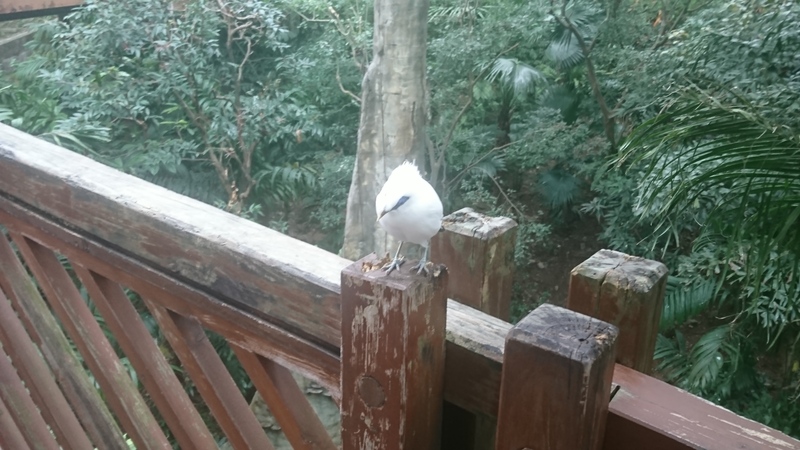 There’s also a brilliant Aviary where you can walk through and a lot of the birds will get very close to you. It was then down to the harbour for views of Kowloon, waiting for dark for the contrasting photos and back to Kowloon for more food and bed. On the third day, I went across to Lantau, the West Island and closer to the airport. The MTR was again my transport of choice. I changed lines once and it was so easy. Their platform structure is brilliant – I hopped off my train and straight across the platform to a train going to my destination. The return platforms were on another level. I had a pineapple bun with cream for breakfast and it was amazing! 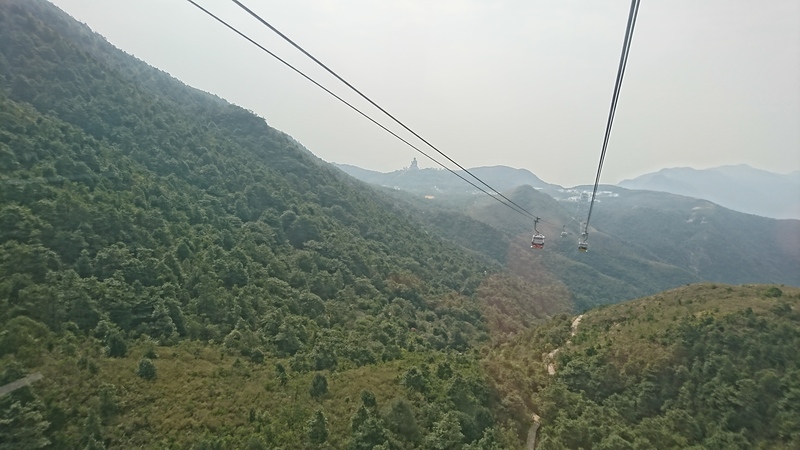 From there, I took a cable car up to Ngong Ping. I queued for about 45 minutes but it can be much longer. Remember, I don’t like heights but put a brave face on and took some pictures of the awesome views. Got talking to the guys in the car with me – there are some perks to travelling solo! I arrived in a village-type setting designed to reflect the times of the time. Up here was the Tian Tan Buddha (Fat Buddha) and the Po Ling Monastery (Temple of Ten Thousand Buddhas). It was so calm and serene, even with the amount of people around. The village itself is full of shops and restaurants. 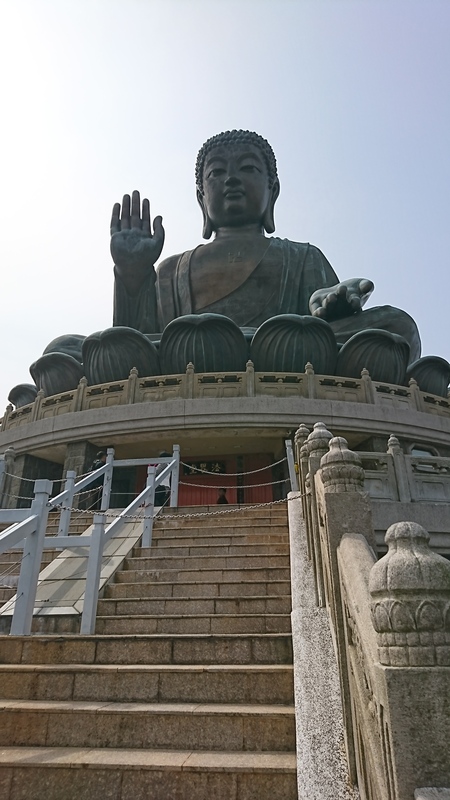 The monastery is beautiful and the Tian Tan Buddha itself was incredible – even after all the steps to get to it. There’s also a walk around the area and bus routes to other areas on this island. Now, unfortunately, I left about 3pm. I wanted to relax as I had an early flight the next day to Melbourne. I did wander around Kowloon some more but nowhere new. I was back in the hotel from 9ish and had an early night ready for a nine-hour flight. 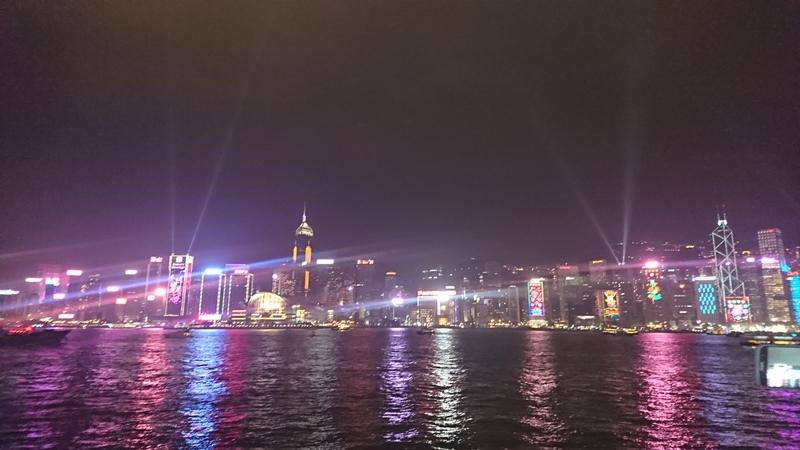 All in all, I loved Hong Kong and would love to go back again to see a lot more.